My friends from Lalalandshop in Australia make the cutest products with my illustrations (and with the work of many other wonderful artists). 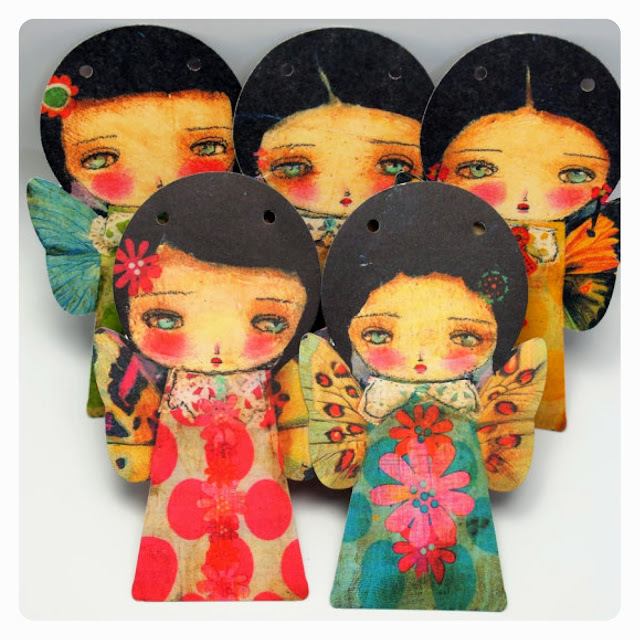 One of my favorites has been the Fairies Bunting Kits that feature 10 double sided fairies (that means you can hang them in a window and you could enjoy them inside and outside!) and string to hang them. They come ready to assemble and they're so, so cute! They're sold only in Australia, but I want them to be available to my customers everywhere else, so I got a batch and now I'm offering them in my Etsy Shop (I only have a limited quantity!). If you want one (or two or maybe three!) you can get them here. I hang mine over a big painting and in my daughter's bedroom. My sister hangs them in her living room window. They just fit anywhere. Where would you put them? If I had them I would hang them over my desk! Your work has amazed me since I discovered your Etsy store 4-5 years ago while living in Alamogordo NM. Love your stuff!! !